The Club is very active with several layouts on the exhibition circuit and under construction at our Clubroom in the centre of Uckfield. 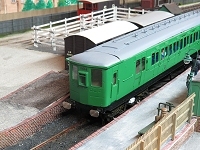 Details of these and of layouts belonging to members may be accessed by clicking the buttons on the left. Those currently available to attend exhibitions are listed below. If you are a visiting Exhibition Manager and would like more information on any of the layouts shown, with a view to inviting them to your event, please contact us via our contacts page. 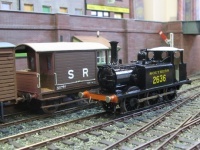 Lower Shalford is our large 7mm/ft scale standard gauge layout. It portrays a ficticious Southern Railway terminus in the Guildford, Surrey, area allowing stock from all three pre grouping companies to be run including three rail stock. The layout measures just under 27ft x 2ft 6in with a turntable fiddle yard to the right hand end. Click here for more details. Our latest layout to emerge on the exhibition circuit, Oakley portrays a preserved transport and historical museum set in a Midlands quarry. As such a variety of locomotives and rolling stock can be run. 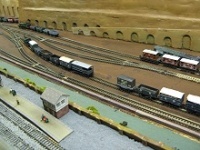 The layout measures approximately 10ft 6in x 2ft 6in and has a small fiddleyard to the rear. Operation is from the front and the back. Click here for more details. Arnold Layne is our small 9ft x 2ft 7mm/ft scale standard gauge layout. Planned as a minimum space project with hopefully enough operating potential to entertain both the operators and an exhibition visitor. It portrays a small 1930s Southern Railway suburban station served by a light but frequent passenger service and a small but busy goods yard. Click here for more details. If you would like to get involved in the Club's modelling activities, please contact us via our contacts page.